Phở Vi has what I consider to be the best phở gà in Hanoi. I wish I knew what made it so great, but there are three elements that ride at the top of my list: heavenly made phở noodles, the highest quality chicken, and a soup so delicious you wish you could take a bath in it. 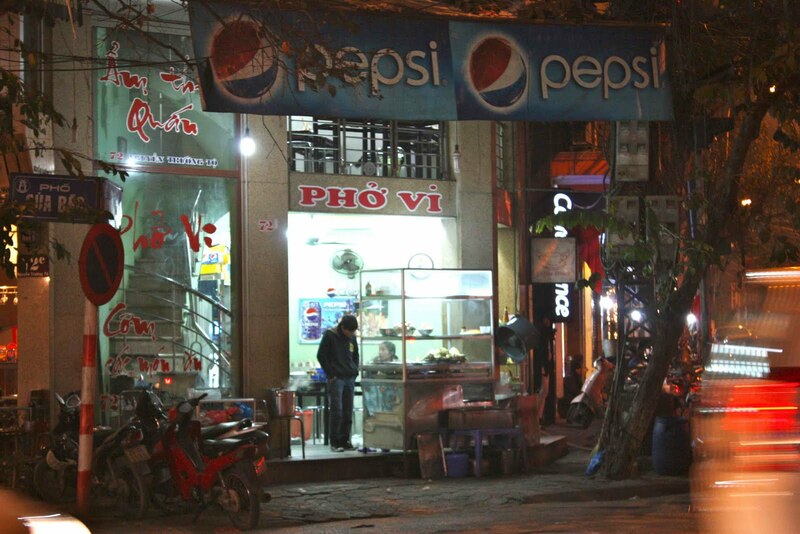 Phở Vi also makes cơm binh dân dishes – cheap (unless you’re overcharged) pre-made dishes to be eaten with rice – that my stomach wholeheartedly recommends. 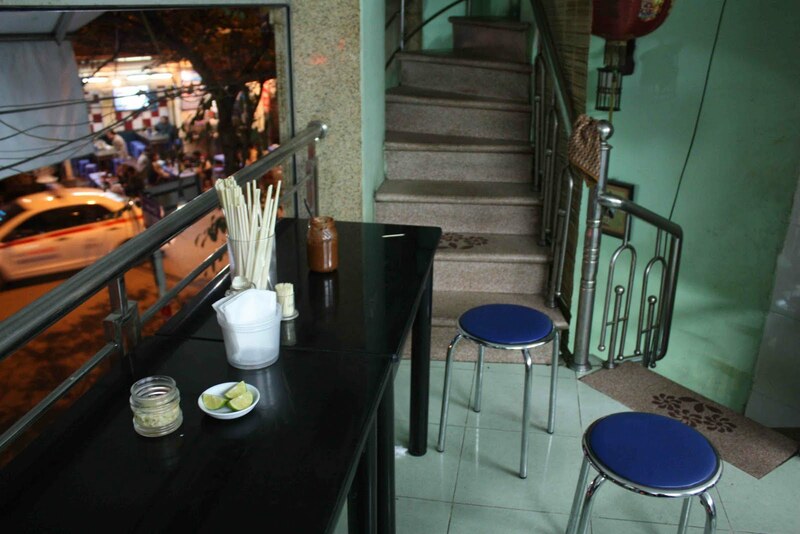 The ambience of Phở Vi is better than most pho restaurants, in large part because the place is kept clean. The mint-colored walls and floor tiles aren’t exactly a selling point, but if you’re looking for a place without water stains and mildew creeping over the walls and ceiling, this is the place for you. It also offers views of the busy intersection where it’s located, and as you eat your phở you can casually watch people at another phở restaurant across the street do the same thing—this offers the advantage of making you feel superior to them for not eating as delicious phở as you are. And phở at night is more atmospheric, as darkness makes the neighborhood appear more charming. I’ve gotten in the habit lately of eating quầy with my phở. 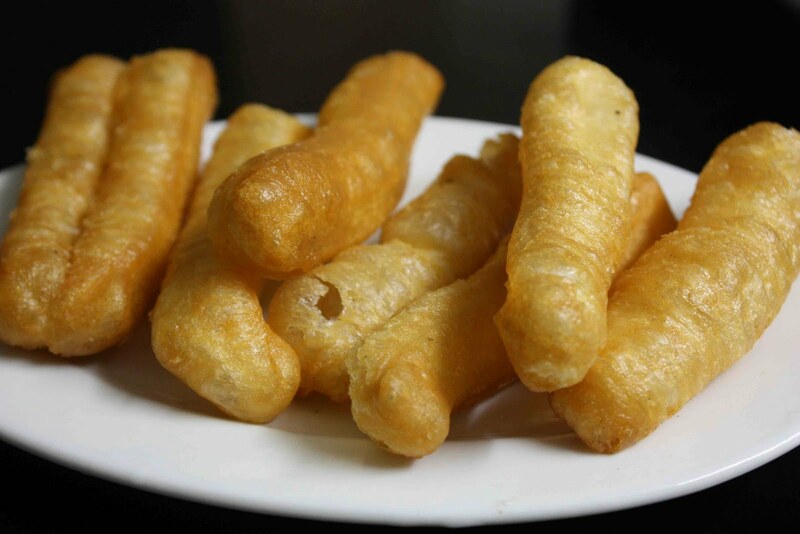 Quầy are basically just long, flaky, hollow pieces of fried bread used to dip in one’s broth. I like them in part, too, because they’re more food. Well, that plus the fact that they go really well with phở. 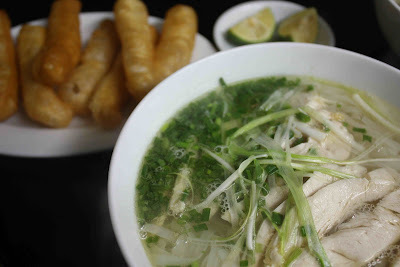 On this night we ordered phở gà không da—chicken phở without any pieces of chicken skin—and as you can see in the photo below, Phở Vi gives generous slices of chicken cooked to perfection. Look at that broth, too—as clear as the purest boiled tap water on earth. 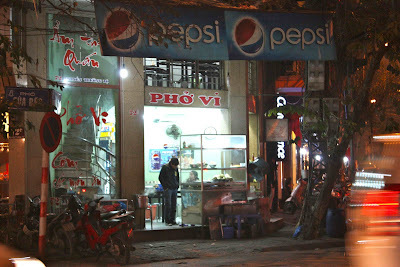 Phở Vi is located at 72 Cửa Bắc Street, at the intersection with Nguyễn Trường Tộ Street. 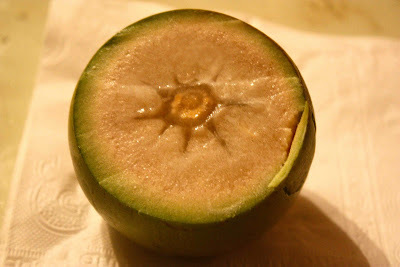 On the way home we stopped on the sidewalk and bought a handful of qua vú sữa (translated literally as breast milk fruit, but known in English as a star apple). Winter is the month for this fruit—at least it is in Hanoi—and women in conical hats are selling these from the backs of their bicycles seemingly everywhere now. The fruit is certainly interesting. It has a soft rind, and you’re meant to squeeze it gingerly for a while before cutting it open, to get the milky juice flowing. Then, once you’ve sliced off the top, a simple press of your finger onto the fruit’s flesh will bring a spoonful of milk to the top. 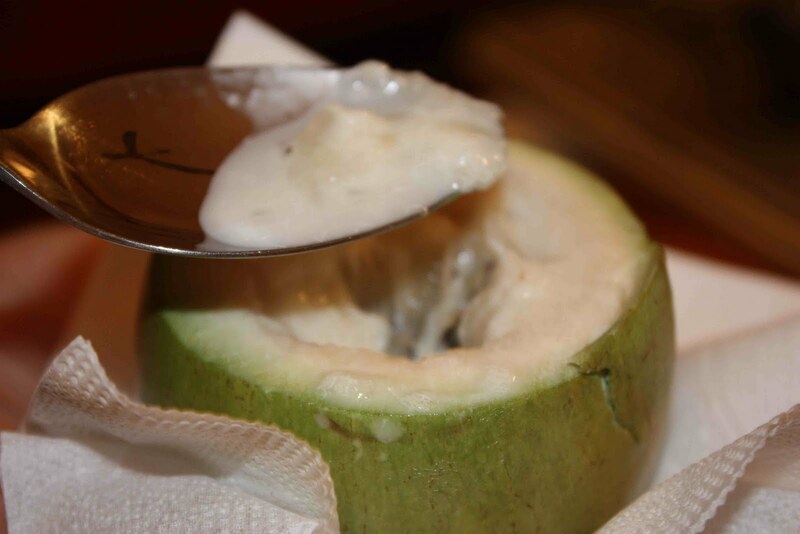 We used a spoon to scoop out the fruit, whose mild taste is like a mix between a hồng xiêm (sapuche fruit) and a coconut. wow that fruit is very interesting. Really love reading your blog, as I've said many times. 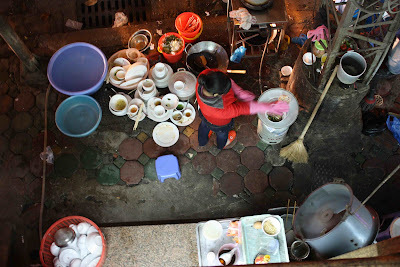 I remember those street pot washers from my holiday in shanghai! That pho looks delicious also, thanks for sharing. Tangled Noodle: Happy New Year to you, too! I’m glad to know you’re in Manila, and that while other Minnesotans are freezing their tails off you’re basking in the sun and warmth of a beautiful, tropical island nation. : ) Hey, we’re like neighbors now! I’ve never been to the Philippines, but maybe it’s time to think of making a trip. 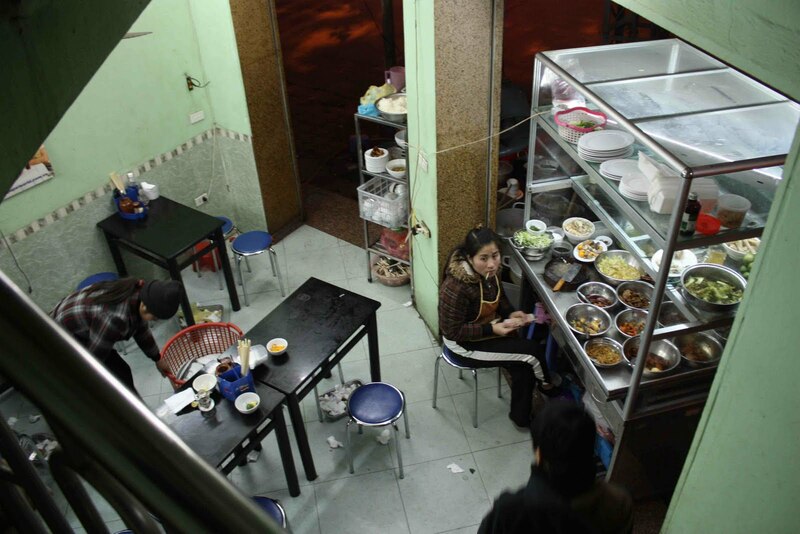 Especially this winter––it’s so cold in Hanoi now! Thanks, as always, for your comment! Sippity Sup: Hey Greg! Happy New Year! Yes, you’re right, I took a long break from blogging, and I’m not exactly pumping out new entries these days, either, but I’m trying. : ) It’s hard to imagine that I inspired you, or anyone else for that matter, but it’s really nice to hear you say that. I’ll have a look at your story later today––I can’t wait to read it! Also, if you’re interested, I have another blog devoted to my last novel: http://avietnamesenovel.blogspot.com. It’s a work-in-progress––the blog, not the novel––but if you have Vietnam on your mind, maybe the excerpts I’ve put up there will be just what you need. : ) Take care, and keep up your amazing blog! Don't Fly on Air Asia!